contests the legality of the vote, but what it can about it is unclear. "Western politicians have largely become hostage to the mess created by weak journalism and their superficial media. This has created an alarmingly false impression about Russia and its leaders. ... Perhaps British and American operatives or spies have again failed to rise to the occasion and have 'fed' their nation's leaders with delusion. ... In these harsh times, Westerners should ask for advice from keen observers of state politics like Latvians, who have suffocated under the Soviet yoke." 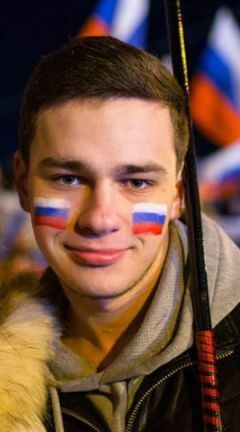 A man with a Russian flag on his cheek in Simferopol's Lenin Square, Crimea, March 16. 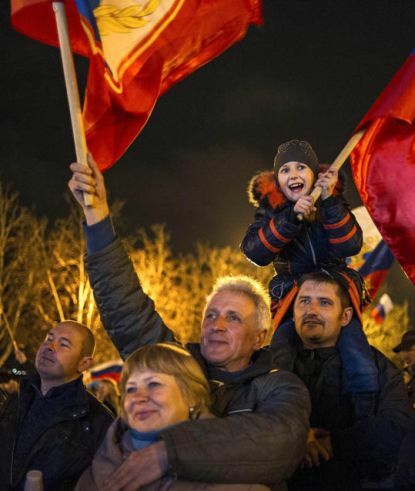 Over 90 percent of Crimeans are said to have voted for annexation by Russia. Western politicians find it difficult to define their position on the Crimea/Ukraine crisis. Thus Kenneth Owen Morgan, a member of the House of Lords, who was in Riga last Friday, acknowledged his bewilderment and inability to understand Russia. Politicians of the world's greatest powers, the United States and European Union, don't know what to do or how to deal with Russia. That's understandable, because Western politicians have largely become hostage to the mess created by weak journalism and their superficial media. This has created an alarmingly false impression about Russia and its leaders. Now, though, decision makers see that the reality of Russia doesn't coincide with what has been written and shown. Perhaps British and American emissaries spies have again failed to rise to the occasion and have “fed” their nation's leaders with delusion. In these harsh times, Westerners should ask for advice from keen observers of state politics like Latvians, who have suffocated under the Soviet yoke. We can speak Russian, understand Russian jokes, and know Russian prefixes and endings used in the mother tongue: “Why have you piled [that crap] so high? Dump it immediately!” This phrase is uttered in Russian, so not a single word is censored. When it comes to Crimea and Ukraine, the pile is way too high, and it will all have to be dumped. Chancellor Angela Merkel of Germany recently had a misimpression of Russian President Vladimir Putin, which showed she was living in a world disconnected with reality. Unfortunately, I have to say that, the very shrewd Merkel is wrong. She really doesn't understand what she's dealing with. Komsomolskaya Pravda, Russia: Crimea: the Next Puerto Rico?